Skandia Third Friday Dance, January 19, 2018, Cedar Valley Grange, 20526 52nd Ave W, Lynnwood 98036. Tom Sears and Lisa Brooks will teach Rørospols from 7:30 to 8:30pm. This is a popular and fun dance from the town of Røros in Norway. 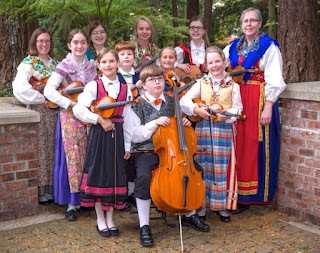 At 8:30pm, the dance starts with music from the Seattle Lilla Spelmanslag, then Karin Code from Kalamazoo, Michigan, will play hardingfele music, along with Hale Bill and the Bopps, until 11pm. Class, 7:30pm; dance, 8:30–11pm. $15 (Skandia members, $10); kids, free.